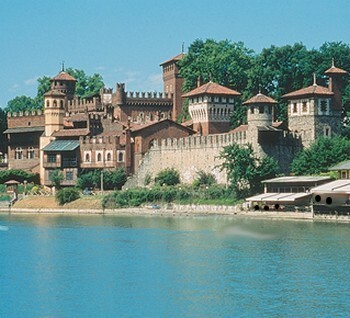 "Il Castello dei Tarocchi" appeared in August 2010. It was intended to accompany a Tarot exhibition in Turin in July 2010 in the Borgo e Rocca Medioevale, which once had been constructed 1884 and served in the Exposition Mondiale in Turin 1911 as a Museum. However, some unlucky technical conditions made the exibition impossible. 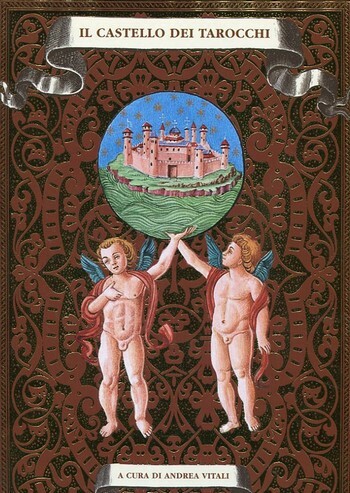 The book was produced in Italian language as an anthology with the participation of leading Tarot history researchers, most from Italy and some of foreign countries, between them a few connected to the intensive research of Trionfi.com. The essays present topics of six centuries Tarot history and are accompanied by more than 500 pictures. Essays by Giordano Berti, Alain Bougearel, Franco Cardini, Ross Sinclair Caldwell, Thierry Depaulis, Gerardo Lonardoni, Alberto Milano, Lothar Teikemeier, Giovanni Tesio, Bepi Vigna, Andrea Vitali, Girolamo Zorli. Cardboard cover printed in gold with warm marks. Measures: cm. 33 x 24. 224 full colour Pages, 580 figures. Volume created with the contribute of Piedmont Region “Culture, Tourism and Sport”, Library Department, Archives and Cultural Institutes. The history of Tarots written by the most important scholars. An art book, totally updated, extraordinary for the number of images and texts. A whole work to understand the origin, the historical evolution, the symbols and the myth of the most beautiful cards in the world. From the didactic and encyclopaedic decks of the XV century to the Ludus Triumphorum; the illuminated cards of the courts and for common people. The number of Triumphs in the first illuminated decks and their following transformations. Tarots as archetypical ideas of different kind; the Green Tara and the gathering of the 21 Tara; the path of mystic symbolism. The numerological structure of Tarots and its derivation from the Pythagoras’ arrhythmology. From Petrarch’s Triumphs to the Ludus Triumphorum; the Christian path of the Staircase as teaching marked on the 22 Triumphs; Tarots and Art of Memory. The Prince Francesco Antelminelli Castracani Fibbia, inventor of the Ludus Triumphorum. The game of Tarots among Court and Popular Culture. The mental and symbolic structure of Triumphs; the iconological influences of philosophy and of the great plastic-figurative art of the Renaissance. The 22 Triumphs decoded at the light of Christian spirituality, of the Ancient myths, of the neo platonic philosophy, of the hermetic-esoteric current. The meaning of the seeds of tarots cards as they were interpreted during Renaissance. Sonnets, satires, combined tarots and literary works written about tarots from the XV to the XIX century. The game of Tarots in “The Castle of Crossed Destinies” by Italo Calvino. The position of the Church and civil authorities; Tarots as ingenious game; documents and testimonies. Tarots and Tarocchino from the XVI to the XIX century; geographical decks, with landscapes, scenes, with double figure; printers and ways of making. The first factories and documents; the rules of the game; the age of gold; The Liguria- Piedmont Tarot. Vacchetta’s Naibi (Spanish Naipes) of among academic exercise and neo gothic current. Cartomancy as a divinatory practice used since the Renaissance; Tarots in the witch tradition; Cartomancy in Europe; Cartomancy among Esoterism and Occultism. The origin of the Esoteric Tarot and the oral tradition of Masonic lodges in the XVIII century. From Etteila to Aleister Crowley; the esoteric and occultist Tarot in France, England and Europe. Tarots created by the most important artists of Nine Hundred and of our century; symbols and painting - artistic techniques.